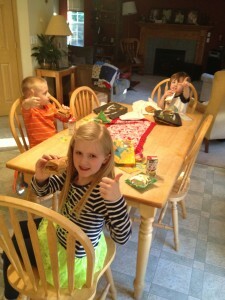 Home » Featured » Subway Fresh Fit Giveaway! Recently, The Center for Science in the Public Interest released the results of “Kids’ Meals: Obesity and Poor Nutrition on the Menu,” an investigation into the nutrition quality of the kids’ meals served at the nation’s top 50 chain restaurants. 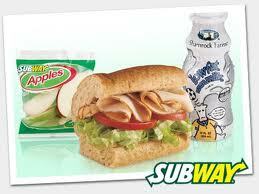 SUBWAY® restaurants stood out as the only chain to meet CSPI’s criteria – for the entire FRESH FITTM for KIDS menu!! I don’t know about you, but children’s menus at most restaurants make me sad. With all of the fried and high fat/calorie options, it’s no wonder our nation’s children are at risk. That is why I am so proud to work with Subway. All of SUBWAY® restaurant’s eight children’s meals, which include a 4” sub, apple slices and low-fat milk or bottled water, amount to less than 430 calories, less than 35% fat, 0 % trans fat, 35% added sugars and 770 mg of sodium, and meet both the expert and industry nutrition standards. With four kids and a hectic schedule, I understand that sometimes it is easier to go out to eat. The next time you want to/need to grab a quick meal, why not make a healthier choice for your kids and choose Subway? 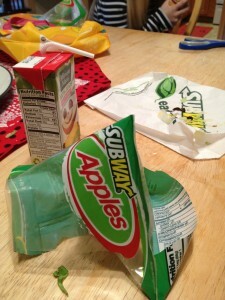 My own children were SO excited to head to Subway for dinner. Each of our three older children had a FRESH FITTM meal. They loved being in control of their sandwich and felt pretty grown up giving their order to the sandwich artist. I had a proud mama moment when my two older kids ordered veggies on their subs! (Yay!!) My kids had a healthy and delicious meal for the same price as a more traditional fast food meal. They also really loved their Phineas and Ferb reusable tote bags too! I think this picture speaks for itself….they really enjoyed their meal! All three kids cleaned their plate and enjoyed every bite. A meal that is healthy AND kid-approved is a win in my book! A lucky Chasing Supermom reader will have the chance to take their family to Subway with a $40 gift card! Good luck! *I received a gift card in exchange for this review. All opinions are my own. I like turkey on honey oat with pepper jack and all the veggies. I love the chicken breast on italian herb and cheese bread.